We all started in the same place: in the safety and warmth of the wombs of our mothers. They may have had different parenting techniques, recipes, quirks and stories, but they are all mothers. Artist Sonja Thomsen and storyteller Adam Carr aimed to celebrate the universality of motherhood with their public art installation called here, mothers are. 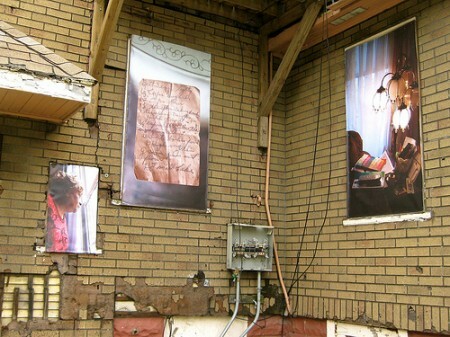 The temporary public art piece, located at Locust & 24th Place in Milwaukee’s Amani neighborhood, uses vacant and foreclosed property, photography and quotations to tell the stories of area mothers. It formally opened April 7, and is slated to run through October. Thomsen and Carr spent three months conducting living room interviews with eight women from the Dominican Center for Women, Inc., 2470 W. Locust St., later translating their stories into art. “Inviting us into their homes, recalling family stories and sharing their time — they are the inspiration for the piece at 24th Place and Locust,” Thomsen said. 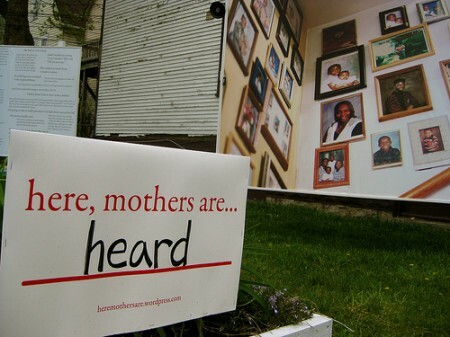 The “pop-up” gallery also features an online component that allows people to reflect upon and share their own personal stories about motherhood. The collaborators originally met for an interview in 2010 when Carr worked at 88Nine RadioMilwaukee. However, it wasn’t until more recently that they started working together. In 2011, Thomsen had the opportunity to pursue her career-long interest in public art when she was offered funding from the Neighborhood Improvement Development Corporation Milwaukee. Thomsen thought of collaborating with Carr because of his knowledge of Milwaukee and its organizations. Simultaneously, Carr had been looking for collaborations that would bring him outside of his comfort zone of broadcast and digital storytelling. In late-fall 2011, the duo decided to use their skills together to produce public art. Thomsen said the response and support from the Milwaukee art community and local media has been great. The two said they hope to collaborate in the future and are looking into creating different installations of the project throughout Milwaukee. Carr encourages people to not just read about the project, but experience it. After viewing the art, online readers can visit heremothersare.wordpress.com and share their own stories or reflections about the exhibit.